In late 2007, it was announced that Germany-based TUI Cruises would form through a joint venture between Royal Caribbean Cruises Ltd. and German shipping and travel giant TUI AG (which also owns U.K.-focused Marella Cruises). Both parties hold a 50 percent stake in TUI Cruises. The aim of the Hamburg-based line is to provide the German cruise market -- an already thriving sector (with Carnival-owned AIDA and the upscale Hapag-Lloyd cruise division, another line owned by TUI AG) -- with another option for couples and families. TUI Cruises says "guests can enjoy space, relaxation and personal service." On May 15 2009, TUI Cruises launched its first ship, "Mein Schiff," at the Hamburg Fish Market. TUI Cruises held a contest to determine the ship's new name -- and more than 11,000 people sent in over 30,000 suggestions. The winner was Mein Schiff, which translates to "my ship" in German. Mein Schiff will be familiar with some cruisers -- the ship was transferred to the line from Celebrity Cruises where it sailed as Celebrity Galaxy. Formerly Celebrity Galaxy, the renovated 1,924-passenger Mein Schiff serves German-speaking cruise travelers through the cruise line TUI Cruises. 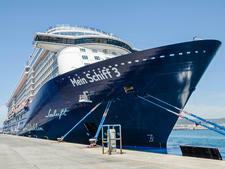 Highlights on Mein Schiff will include 13 lounges and bars, as well as a refurbished sushi restaurant and a steak house. Passengers can relax as there is no need to book for dinner -- all dining is open seating. Wine and beer with dinner are included in the fare. One very European touch is that every cabin will feature an espresso machine to help provide that kick-start to the day. Other highlights of the ship include a 1,700-square-metre Spa area boasting recliners for relaxation; private spa suites; and a 2,200-square-metre pool deck with private relaxation areas. TUI Cruises is a German cruise line and will be geared to German-speaking cruise travellers, from families to couples to older folks. TUI Cruises' one ship, Mein Schiff, was built at the Meyer Werft shipyard in Germany and entered service in 1996 as the77,713-ton, 1,850-passenger Celebrity Galaxy. After Mein Schiff was handed over to TUI Cruises from Celebrity in San Juan in March 2009 (where it had been sailing Caribbean itineraries), work began on a 50 million Euro conversion -- which included adding a massive 428 balcony cabins to the ship (As Celebrity Galaxy there were just 220 balcony cabins). The ship also boasts new spa cabins. The ship's livery is one of the most unique in cruising, with huge calligraphy-style writing along the side of the hull designed to evoke "emotional associations with maritime holidays," according to TUI Cruises.